Universal is finally re-releasing the movie on May 8th. More info here. Great news; this means that I'll finally be able to upgrade from my worn-out VHS version. Good news but this doesn't exactly seem like a film you need to see in the highest possible quality. I'm fine with the previous disc. First the stock market crash and now the OOP DVD futures market takes a hit! How much worse can today get? davebert wrote: First the stock market crash and now the OOP DVD futures market takes a hit! How much worse can today get? Heath Ledger dies. Today we have hit rock bottom. According to TVShowsonDVD, the MST3K crew have let their license with Rhino end, and have signed on with Shout! Factory instead. Jim Mallon is running the whole show for this. That's why he takes such a long credit roll in the press release. He owns the show, now calls it the legacy series because he has a flash cartoon series online with Servo, Crow, and Gypsy. When Mallon isn't contemplating how to make money off this series, he seems to be in conference with his lawyers on who to sue next for infringing on his rights to "prerecorded movie riffing." If you didn't know Joel has a new straight to dvd series called cinematic titanic, while Mike has the movie crew. Nihonophile wrote: If you didn't know Joel has a new straight to dvd series called cinematic titanic, while Mike has the movie crew. There's also Rifftrax, of course, though the few I've listened to have been quite hit and miss. Nowhere near the standard of peak MST3K. gasp! splutter! wheeze! My God, man, you can't just post that without any context! What's in that gigantic box that will be mine? I've been laying off buying any of the other sets since I've been busy buying other stuff like Criterion. This is only $48.99, while other sets of just one volume are only a few dollars less than that so what exactly is in this set? From what I can gather, it is still only 4 discs (like the previous Rhino releases), but it is "lavishly packaged." A couple of titles were leaked ("Werewolf" and "Laserblast"), but those were later denied by Shout Factory. According to the nerdlings at mst3kinfo, the exact contents will be announced at Comic-Con in San Diego on July 25th. Matt wrote: From what I can gather, it is still only 4 discs (like the previous Rhino releases), but it is "lavishly packaged." A couple of titles were leaked ("Werewolf" and "Laserblast"), but those were later denied by Shout Factory. And they weren't necessarily denied, they just mentioned that they might be in either this or the early 2009 set, and they might not be in either - they don't want to get anyone's hopes up. So one or the other might be in here. I'm thinking that Laserblast is a shoo-in. Sorry for posting it without any context! There really isn't any so far. Details on the bonus features are starting to leak out. 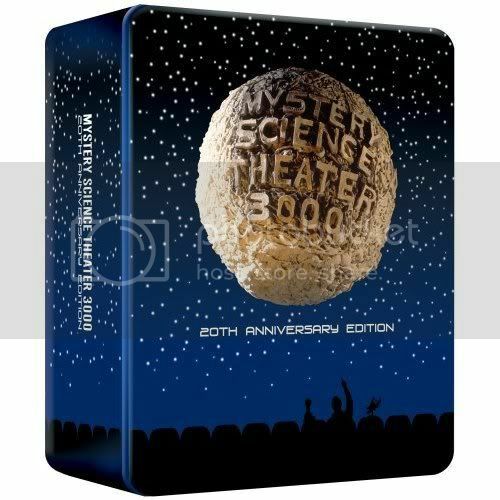 And depending on the length of that History of MST3K doc, they're potentially very exciting. It will include a Crow figurine and collector's cards as part of the set. What a coup for Shout! Factory. The Joel ep is the only one I haven't seen, but Laserblast, Werewolf, and Future War are classics. I've got a Mike Nelson bias, but I'm glad to see two of the funniest SciFi era episodes on this set, because it shows that they're not going to shy away from releasing those. "Soultaker" is one of the funniest episodes ever. Still waiting for "The Final Sacrifice" though. The Final Sacrifice? But, butâ€¦ â€œYes, we realize that we said it would never be released,â€ says our source. â€œWhy the change, you ask? Well, to be frankâ€¦ We offered them more money.â€ Always a good plan. "I wonder if there's beer on the sun..."
Fantastic looking set, as are all the Shout Factory boxes. I wouldn't even mind if they double-dipped on the Rhino episodes, they do such an exemplary job. This is the best news I've seen all day, The Final Sacrifice is neck and neck with Space Mutiny as my favorite episode.